Although Cluny is a garden for all seasons, April has to be one of the most exciting months when plants are literally bursting out of the ground and flowers of many varieties begin to make an appearance. Throughout much of the month bulbs and tubers are the dominant ground cover particularly Erythronium and Trillium species. Erythronium revolutum or “the mahogany fawn lily” has naturally spread over large areas of the garden. Originally from the west coast of North America, it has graceful pink nodding star-shaped flowers with recurved petals and mottled leaves. Other less prolific but still very beautiful Erythronium species include yellow toulumnense and white californicum. Cluny has approximately 18 varieties of white or maroon Trillium (Wake Robin, Wood Lily) which are easily recognised by their 3 leaves, sepals and petals. They are generally clump forming rhizomes taking many years to establish into sizeable plants but as woodlanders, they enjoy partial shade and a neutral to slightly acidic soil in a wind free position. Some of the trillium clumps at Cluny will now be around 60 years old. One of the delights of April is the appearance again after the winter of pollinating insects. Favourites amongst these have to be the bumblebees. Their constant humming on Acer and Rhododendron flowers on fine days has to be a gardener’s delight. A really interesting insect which occurs at Cluny in April is the bee fly (Bombylius major). It mimics bees having a hairy body but with a very long proboscis enabling it to feed on nectar while hovering above flowers, primrose being a favourite. The aspect and soil conditions at Cluny are very much enjoyed by Himalayan primulas with the less common Petiolarid species flowering in April. Of particular note is Primula sonchifolia a beautiful blue primula with a white-ringed yellow eye. The flowers first appear in a tight rosette in the centre of toothed leaves covered in a mealy powder described as farinose. Eventually the flower head is pushed up on a farinose stem. Other early Petiolarid primulas include the rich purple P bracteosa, pinky purple P gracilipes and gracilipes minor. An interesting one for ground cover is the pale pinky-blue P hoffmaniana whose flower very much resembles our own primrose but it grows in a carpet propagating itself by runners with next year’s flowering plant at the end of each runner. There are also drifts of the more common primulas like oxlips, cowslips and primroses. By the end of April the first candelabras appear with orangey yellow P chungensis and wine red P pulverulenta. 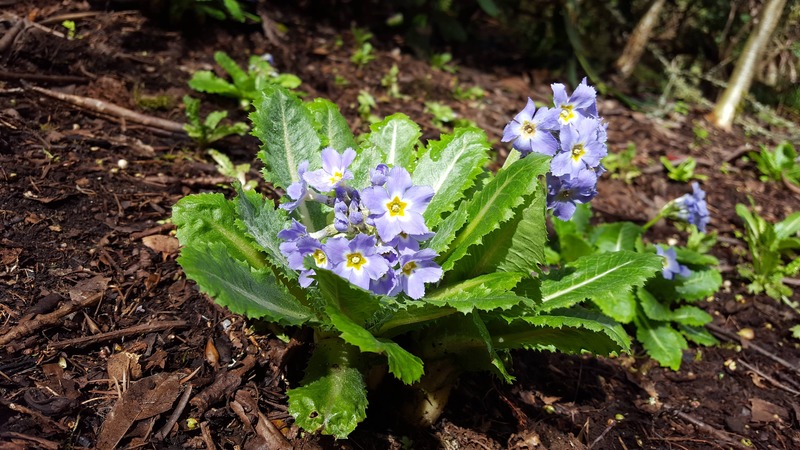 These are much easier primulas to grow preferring moist soil and self-seeding in many areas of the garden. Cluny has become renowned as a guaranteed place to spot native red squirrels. They are very well fed on a variety of nuts but they also feed on a variety of more natural foods within the garden such as cones, blossom, lichens, fungi and seeds. By April the females will be nursing young in dreys lined with moss, leaves and lichen. For added calcium in their diet, red squirrels gnaw at deer antlers so a few of these are placed in strategic spots in the garden. Spring really comes to the fore in April with many other wonderful perennials appearing. Some favourites include purple Cardamine pentaphylla (showy toothwort), cream Cardamine enneaphylla (nine-leaved toothwort), rich yellow Hylomecon japonica (Japanese wood poppy) and blue Corydalis flexuosa. A number of rhododendrons and magnolias also begin to flower and hopefully no late frosts will damage their delicate blooms. April at Cluny is a truly atmospheric month with delicate spring scents, a backdrop of bird song and growth happening before your eyes!